The North Branch Reformed Church Preschool uses the Fruits of the Spirit Christian Curriculum for our 2 ½ to 5 year old students. Each month we discuss one fruit, beginning with “Kindness” in September when children are reminded how to use kind hands and kind words with each other. Pastor Mark and Pastor Todd visit each classroom at the beginning of the month to read a Bible story with the children and pray. During Circle Time, a weather report is given and the children will sing a weather song. Before our snacks and meals, the children say grace, thanking God for their food. Our Music teacher, Mrs. Sheeley introduces the children to many Christian songs, like Jesus Loves Me, Mary Had a Baby, He’s Got the Whole World in His Hands. She also prepares the children for our Christmas Pageant and other programs. We are blessed to be teaching the children about God’s love for them. 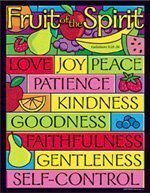 Here’s a link to a fun Fruit of the Spirit song.